Discussions about creativity, growing old, growing young, self-publishing, freedom, the craft of writing, art, and many other topics. Part confessional, part thinking out loud, I write what interests me at the moment. BTW, I write my books under the pen name R. Patrick Hughes. Raising a grandchild is not something I planned on doing when I was raising my own children. It can come about in a myriad of ways. But when it happens to us, we have to make adjustments. We have to deal with a new reality, the reality that there are significant differences between being elderly and being a child. The biggest difference between the elderly and the child is the sense of time. For the elderly, time is going by quickly; for the child, time is going by slowly. This makes for some problems when it comes to deadlines. It makes for conflict. The last thing we grandparents want is conflict, but there it is day in and day out. We grandparents are in a hurry, because time is running out. Our grandchild is not in a hurry; to her time is going by slowly and she has all the time in the world. So, when it comes to getting her dressed, or getting her to school, or getting her to go just about any place, especially places she doesn’t want to go, conflict raises its ugly head. “Hurry up, you’re going to be late,” we say over and over again as the child dawdles. We’re focused on one thing—being on time. The child is focused on another—the imaginary friend he's playing with, the toy he can’t find, finishing the game he's playing in his mind. What are some of the conflicts we encounter virtually every day? Getting the child dressed. Getting the child to eat (eating seems to be the last thing on kids’ minds, at least, until they get hungry). Getting the child to the point of readiness, in general. Getting him bathed and to bed at a reasonable hour. What does this mean for us grandparents? It means we have to be patient. We have to control our temper. We have to walk a fine line between prodding the child along without screaming at her, without physically manhandling her and, at the same time, getting her to the state of readiness. It tries us in ways we can hardly tolerate, but tolerate it we must. The conundrum is that as elderly people, we want to focus on ourselves and the things that interest us. Of course, one of our interests is our grandchild, and we must focus on him or her first. We must slow down, think, be patient, and manage the conflict. What is the reward for this? The reward is that our grandchild loves us. The child wants to shower us with love, and he does. When the child slows down, he or she hugs us, sits on our laps, kisses us. It’s genuine love he or she has for us. And that’s the reward we get for the sacrifices we make to raise our grandchild. 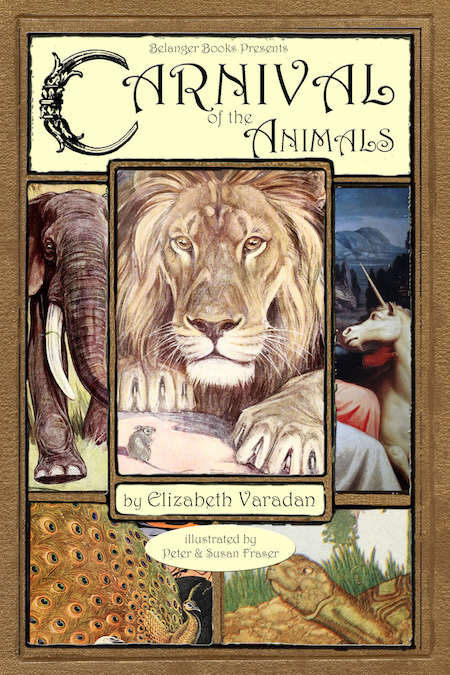 Elizabeth Varadan's recently published children's book CARNIVAL OF THE ANIMALS is a series of tales based on Camille Saint-Saens's musical fantasy of the same name. There are thirteen tales that will appeal to children of all ages. My favorite is "Run Like the Wind." 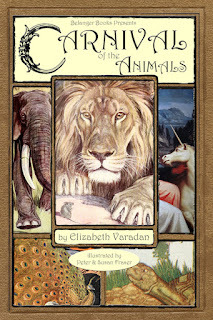 Mrs. Varadan spent much time researching the tales, which shows in the variety of animals and their compelling adventures. Beautifully designed and appealing in appearance, the book will be an excellent addition to any child's library. Mrs. Varadan is a prolific blogger, traveler, and art teacher. You can follow her at Elizabeth Varadans Fourth Wish and at Victorian Scribbles. Her book CARNIVAL OF THE ANIMALS can be purchased at Amazon.com. I've been painting pretty seriously for five or six years now, maybe longer, (I did go about a year during that time when I didn't paint at all). I started painting again after that hiatus when I took a trip to Washington, D.C. and visited the National Gallery of Art. I was so impressed by the paintings I saw there that I was inspired to start painting again. I've been focusing on abstract art. I find a great deal of satisfaction when I paint something that, at least in my mind, works. Many of my paintings do not work and I gesso over them and paint something new on that same canvas. I'm constantly trying to make something new and beautiful. It isn't easy. It can be downright discouraging sometimes. But I keep going, because it is good to finally paint something I like. And, to be honest, I'm still developing my skills (but isn't that true of all artists?) and trying to find my own style. Here are a couple of my smaller general abstracts. They are both 8 x 10 inches. I'm also trying my hand at miniature abstract landscapes. They are 5 x 7 inches. Another theme I've developed is what I call 'Swirls.' They are both 8 x 10 inches. How much I'll continue painting Swirls or miniature landscape abstracts remains to be seen. I'm sure I'll continue with the general abstracts. I'll probably continue with the miniature abstract landscapes as well, at least, for a while. I've done a lot of those that didn't work for one reason or another. As it always is, doing art, whichever kind it is, requires time and commitment. It's certainly easier to find those two elements when you enjoy what you're doing. If you're interested, you can see more of my paintings on Etsy here: RichardPHughesArtist . As is obvious, I haven't mastered the art of photographing my paintings. That seems to require a higher skill level of photography than I have at this time, but I'm working on it. In light of the massacre of seventeen people and the wounding of many more in Parkland, Florida, on February 14 of this year, I have been preoccupied worrying about children going to their schools, their safety, and the safety of the teachers and other people who work at schools. This is something that no one should have to worry about. Why is the worry plaguing me at this time? Why not after the many other such massacres in the past twenty or so years? Did I not care? Did I misunderstand the magnitude of the problem and the possibility that it could happen at any school at any time? I did care, but I took no action, in the mistaken belief that those massacres were aberrations and would not happen again. But now, the repetition of these murders is beginning to have a cumulative effect. It's no longer an aberration that happens to a few unfortunate people. It's becoming a common event in the United States, and apparently happens no where else on earth except possibly in war zones. The way things are now, it will happen here in the United States again, and again, and again. The availability of assault rifles is the main problem. The problem to me, now that I've witnessed through the media the massacres and the horrible consequences of these assaults, is that the preferred weapon of these murderers is the assault rifle, especially the AR-15. (This is also the preferred weapon of assassins attacking other soft targets, such as churches and concerts.) If these weapons did not exist, the assailants would be greatly limited in the number of people they could kill. Yes, I admit that no one anywhere is perfectly safe from being killed by someone with a gun, or a knife, or an ax, or an automobile, or by strangulation, on and on and on the methods go. Most of those methods are slow and cumbersome compared to using an assault rifle. To me this is the correct direction to go in: make it illegal for nonmilitary or non-law-enforcement people to own assault weapons and illegal for these weapons to be bought or sold either in stores or through the mail or on the Internet or at gun shows, or by any other means. We need to remove assault weapons from society. The general public does not need them. That is the most practical way of reducing to virtually none or eliminating entirely mass murder by assault rifles. Make assault-style rifles illegal in the U.S.A.
Reading The Constitution is something that many of us Americans have never done. It's perhaps the most important document our country has produced, and it affects us everyday of our lives, whether we think about it or not. Written in 1787, there was no way for the authors to know what changes and advancements would happen in the future, especially technological growth. I'm fairly certain they would not have envisioned the influx of different religions and philosophies and gadgets and gizmos that would come to play an important part in our current lives. I am not an authority on The Constitution, and will not pretend to be one. I'm pretty uninformed about it myself, which is one of the reasons I'm delving into it, to learn and understand what it says. To be blunt, I'll be reading it to see what it says, and to say what it means to me. My interpretation is mine, and I know many other people may understand it differently. So I invite anyone who wishes to do so to give their opinion in the comments. I will not be on any kind of time table for reading and/or discussing this document. As someone said, learning is long and life is short. I will not discuss every line, article, or amendment. Some of it is pretty cut and dry and doesn't need much interpretation, so I will try to pinpoint the highlights. We the People of the United States, in order to form a more perfect Union, establish Justice, ensure Domestic Tranquillity, provide for the common Defence, promote the general Welfare, and secure the Blessings of Liberty to ourselves and our Posterity, do ordain and establish this CONSTITUTION for the United States of America. Besides being eloquently written, it establishes the general purpose of the Constitution. Everything that follows the preamble is meant to support the various values and objectives within the preamble: to form, to establish, to ensure, to provide, to promote, and to secure valuable rights: a more perfect Union, Justice, Domestic Tranquility, Welfare, and Liberty for themselves and their Posterity (you and me and everyone else alive today in the United States). When it comes to understanding and interpreting the meaning of the Constitution, the Preamble guides us on how to do that. Does your interpretation engender the values expressed in the Preamble? That is the litmus test. If it does, then you are interpreting the Constitution in the spirit of the Preamble and the aim of the founding fathers. An important point being made by the preamble is that each person has a right to the guarantees being established, and that those rights are for individuals. They are for people first and foremost. All of these objectives mentioned in the Preamble are important and worth dying for, if necessary. The ones that really strike me, and which seem most relevant for today in our environment of gun-toting assassins are the objectives of ensuring Domestic Tranquillity and promoting the general Welfare. I will not elaborate on these now, but I will in the future. My eight-year-old grandson Kathan and I have found the perfect sport for us: Disk Golf. Disk golf (Frisbee golf) is just like playing regular golf, but the 'hole' is a metal-chain contraption that you throw or toss the disk into, called the Pole Hole. You play on a course where you have a starting line, fairway, and hole (sort of like the putting green). Each leg of the course has its own par. And there are many obstacles, mainly trees and bushes and, on my course, water obstacles (ponds). Playing disk golf with an eight-year-old is the true meaning of 'play.' Par has no meaning. We just throw the disk toward the Pole Hole, however many throws it takes. When we do reach the hole and land the disk in the metal-chain contraption, we do a happy dance. The rules or tools often change as we go along. One day, Kathan decided to throw pine cones, instead of the disk, at the hole. And the pine cones had to fall through the top of the hole instead of the open area around the circumference of the hole, making it a little more challenging. Throwing the disk into obstacles or hazards actually makes the game more fun. Watching the disk veer off into the woods, then finding the disk, and throwing it out of the woods, or should I say trying to throw it out of the woods, but hitting a tree or tree branch, bouncing the disk back into the woods, is hilarious. We often stop at one hole and throw the disk over and over again at the same metal-chain contraption. We deliberately try throwing around a tree or between two trees that are close together, or climb a hill to throw from. It gives us a lot of practice. And we need it. Sometimes we throw the disk and it flies no more than ten or fifteen feet. No problem. Who cares? We are happy when the disk lands on the ground and rolls an extra five or ten feet. Our playing Disk Golf is challenging and non-world-shattering. There is no winner or loser. There is no score. There is only the joy of good company and childlike play. It's perfect for me, and natural for him. One of Kathan's Christmas presents last month was the game of Memory. Something older people (at least this older person does sometimes) tend to worry about is their memory. How good is my memory? How quickly or slowly am I remembering things? How quickly or slowly am I losing my memory? Should I be playing crossword puzzles or Sudoku, or taking special vitamins or secret-formula concoctions, or eating certain foods, all to help save my memory? What will happen to me if my memory fails? These are not questions that are easily answered. And, the thought of losing my memory is scary. Playing Memory with my grandson gives me much to think about. We've played the game maybe thirty times now, and Kathan has won twenty-nine of those games. I won my first game just a couple of days ago. How? It was plain dumb luck. So even older people can get lucky. Kathan likes to play against me because, and I admit it, I'm easy to beat. The question is: do I have a poor memory? I honestly don't know. The first draft of this post was written a couple of years ago and never posted. Bad me, right. I'm not going to say I forgot about it, but maybe I did. Anyway, it seems just as relevant (to me) now as it did then. We have played more games of Memory since then, and, yes, he still beats me every time. Now we also play other games, games I fair better at: Connect Four and Trouble. But Memory is still my nemesis. Ugh. Where are my memory pills? Lucid Dreaming: the heart and soul of writing. My three books, and a couple of others.